Posted 8/1/2012 6:35pm by Jim Baughman. This weather is presenting numerous challenges for many local businesses. How is Freedom Valley Farm tackling these challenging times? Read Spencer Evening World article (July 16 2012) interviewing Jim as he is 'weathering this storm'....or lack there of. Look for us at these Farmers Markets! Posted 5/18/2012 4:38am by Jim Baughman. NEWS!! We’re now at both the Owen County Farmers Market in Spencer and the Bloomington Community Farmers Market. Both markets are pick-up locations for your weekly fresh produce on Saturdays beginning at 8:00 am. Posted 4/22/2012 3:29pm by Jim Baughman. 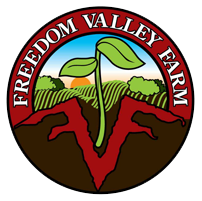 Beginning May 19th, Look for Freedom Valley Farm as a vendor at the Bloomington Community Farmers' Market . Posted 4/22/2012 3:02pm by Jim Baughman. Posted 4/7/2012 9:59am by Jim Baughman. Thank you for reviewing us on the Local Harvest. We appreciate your feedback! Posted 3/24/2012 1:35pm by Jim Baughman. See Freedom Valley Farm in the article '5 minutes with Vanessa Caruso' in 'Notable Edibles' section.